I wasn't aware of this useful feature until just recently. It's been in Visual Studio for a while but if you've never come across it, you wouldn't know it was there. A client application had a few distinct solutions: one for a web app, a separate desktop app, web services and finally a database solution. There were times when I was in one of the solutions and what I really needed to do was find any instance of a particular call - in short, searching the contents of every file. 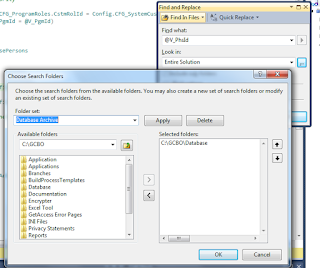 Ctrl+F in VS brings up the Find dialog. By default, it's in Quick Find mode, so it will only search the current document. This can be expanded to "Find in Files", at which point in time, you can identify where you want Visual Studio to "Look in". The default list includes Current Document, All Documents, Current Project or Entire Solution. BUT, note the button with the ellipsis to the right of the drop-down. 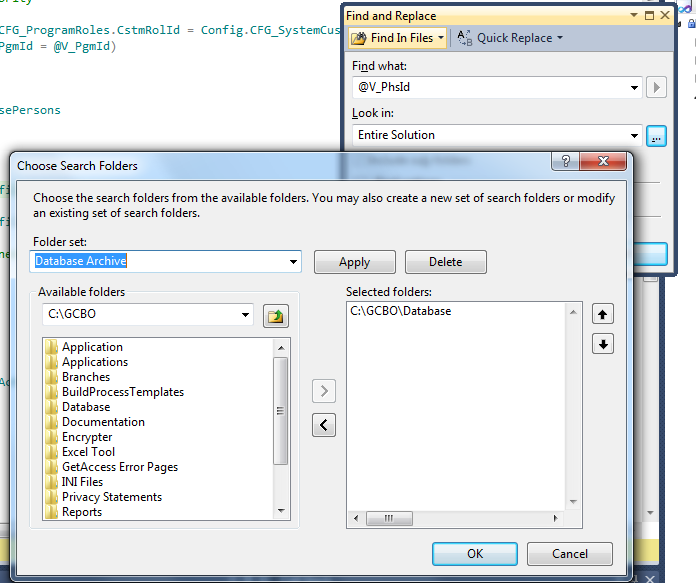 Click that and you can define your own Search Folders Sets. In doing so, you've expanded the list of "Look In" places so anywhere can be searched. The way our application was laid out, I created separate search folders for "Everything", "Database" and "Web Services". Now, whenever I need to search for code within files, I can do it all in Visual Studio, even if the project isn't loaded. Note: This may be a known feature for many developers or it may have been one of those features that were heavily promoted when it was first introduced in seminars, but my experience has shown that many developers start doing things one way and never find out about handy features like this.